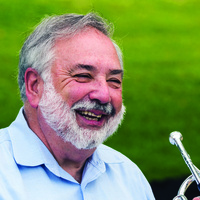 The University of Louisville School of Music and the Jamey Aebersold Jazz Studies Program presents its annual Jazz Festival featuring Vince DiMartino, trumpet, with Jazz Ensemble I and Faculty Jazz Combo. He is 2004 CASE Professor of The Year for the state of Kentucky. This award is given nationally each year to one person in each state in The United States. He is also the recipient of The Governor’s Lifetime Achievement Award for 2008-2009 for the State of Kentucky. DiMartino has performed worldwide as a soloist and with artists such as Henry Mancini, Doc Severinsen, Pearl Bailey, Dizzy Gillespie, and Dave Brubeck. Widely admired for classical and jazz playing, he has also in recent years begun to specialize in virtuoso cornet solos.